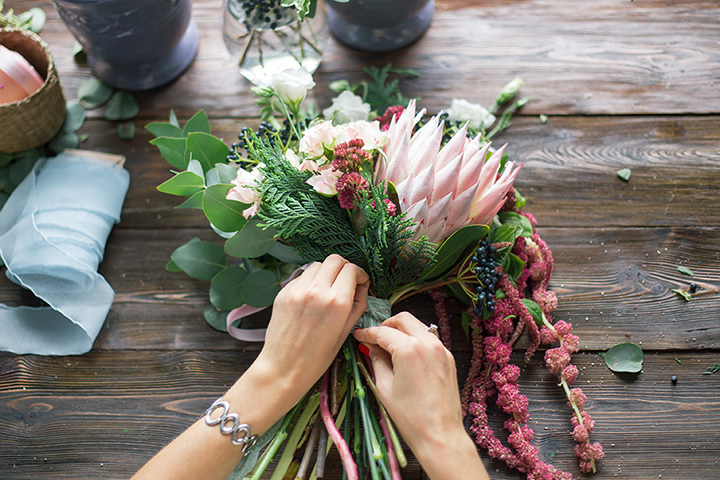 10 simple tips for choosing the best wedding flowers. Number 3 is key! Along with the dress, the ring and that person who pronounces you hitched, flowers are a wedding essential. They add romance, color and beauty to both the ceremony and reception. Face it - you wouldn't walk down the aisle carrying a cactus or a log, right? (If you would, good on you, Quirky Bride). As breathtaking as wedding flowers can be, so can the cost of them. The average price tag is anywhere from $1,000 to $2,000 - and that doesn't count the flowers decorating your reception venue. About 10% of your wedding budget will go for flowers and decor. But don't faint. With an average of 6,200 weddings taking place each and every day in the U.S., there are some great tips that have been picked up along the way to help you make the most of your wedding flower budget. Sooner rather than later. Talk to them about your vision, then trust them to do a great job with your budget. Many brides make the mistake of trying to save money by DIY'ing it. But what they go through in the Stress Department (rounding up vases two days before the wedding? Really?!) is hardly worth it. It's smart money to set your budget, find a floral expert that "gets" you, then leave them to it. On that note, do some homework before meeting with a florist. Learn what types of bouquet styles are available, and what you like. When you do meet with a florist, be very up front about your budget. They're the experts and know how to get the most from the dollars you have available to spend. 3. Create A "Mood Board"
This will help your florist create arrangements that contribute to the feeling you're trying to establish (intimate, edgy, fun). You can add what you do and don't like, color-wise, etc. Sticking to your "board" will keep you from getting swept up in the excitement and blowing right through your floral budget with last minute changes. For example, if you're being married outdoors, you might opt for fewer (expensive) blooms and more things like greenery or botanicals. And don't let a humble venue, like a park or a family garden, put you off: those seasonal touches can have a huge impact. The reason? Bouquets with long, trailing cascades of flowers require lots of long, tedious wiring to hold shorter-stemmed blooms (like orchids) together. Choose flowers with longer stems, like roses, calla lilies or Gerbera daisies, and you'll save a lot of money. For bouquets or arrangements, opt for big blooms like hydrangea or peony. A single stem takes up more room, hence fewer of them needed. Limit how many types of flowers you're using. Between your bouquet, the bridal party and the flowers at the reception, you're gonna be snipping a lot of buds. If your florist has to order a big variety of flowers, but in smaller quantities, you'll be charged much more. Simple always, always works better. If you're getting married in a place that's already pretty stunning, forget big table centerpieces. Most folks hate talking through/around them anyway. Consider hurricane vases or a simple arrangement of stems. Choose flowers that will be in season at the time of your wedding. Going for tulips for a fall wedding will cost much more. Ask your florist to create ceremony arrangements that can be "repurposed" at the reception. For example, your bridesmaid bouquets can later be combined with votive holders or other decorative items at cocktail tables. Aisle arrangements can flank a buffet table.